Course description: As more libraries around the world adopt RDA: Resource Description and Access, knowledge of how to catalog library materials using this new standard is a crucial skill. 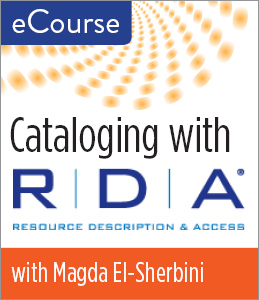 In this eCourse, RDA expert Magda El-Sherbini will get you started with hands-on training that focuses on print monographs and will cover both description and access. You’ll also participate in exercises using real-world examples of RDA concepts. El-Sherbini will be available to discuss these concepts and answer your questions on discussion boards, and you’ll be able to solidify these skills with quizzes that provide interactive feedback. The eCourse begins on April 3, 2017. Your participation will require approximately six hours a week, at times that fit your schedule. For further information on this eCourse, please click here.